Thanks so much for the review and the hilarious artwork. For those who purchase the Sonoma Nail Art polished, your bottles will be secured with some similar looking bio hazard tape. LOL Don't Eat The Polish! Very Small Rocks has to be my favorite, so cool! 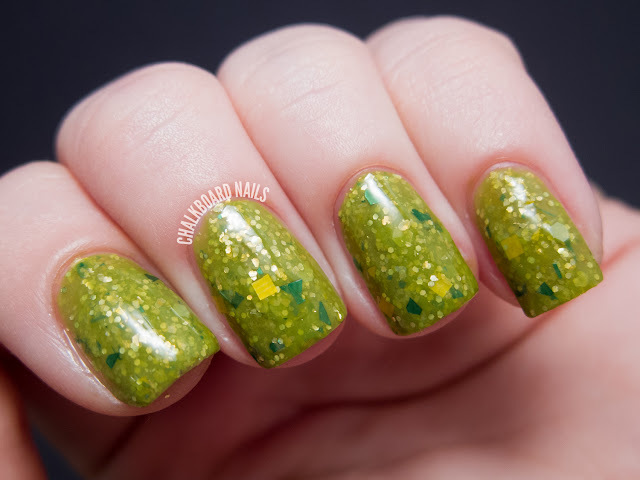 Great swatches and layering ideas! Loved the biohazard tape when I unwrapped mine! Science experiment is hands down my favorite! I need very small rocks. NEED. Thank you, Sarah! I really appreciate the support. 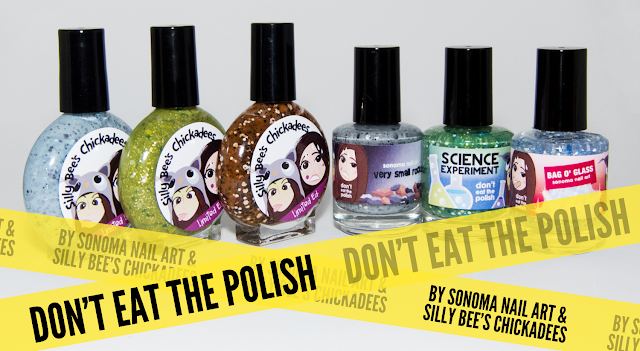 For those of you who order Silly Bee's Chickadees' polishes, yours will be packaged in barf bags. Just kidding!!! Oh my god, Melissa you are killing me!! ahahahahaha! Haha Bag O' Glass makes me think of that old anti-smoking ad Shards O' Glass! All 6 are beautiful! Love the names, everything! I LOVE these polishes! They are so awesome and funny and this collection is so so fun. I LOVE LOVE LOOVE very small rocks. Also diamond glitters! Amazing. hahahahha Bag O Glass! Totally old SNL days - love it. This is a great collection, I want all of it. Very Small Rocks is really cool looking! Oh, these look great! I love the Silly Bee's bottles, too bad they don't ship to Sweden. I love Science Experiment and Very Small Rocks best. I need to try this brand! Cute! Very clever, interesting polishes! It's an remarkable article in favor of all the online viewers; they will get advantage from it I am sure.